Big 12 Texas took on SEC Missouri at the 2017 Texas Bowl in Houston last night and despite the odds against them, the Texas Longhorns crushed the Missouri Tigers 33-16. The win delivered Texas its first winning season in four years. You can’t overstate it. It’s really important for these guys to call themselves a winner… Again, it wasn’t gonna be life or death. We would’ve been just fine next year, but this was a big step forward. The Longhorns win was symbolic for a city still struggling to recover from the widespread destruction of Hurricane Harvey. 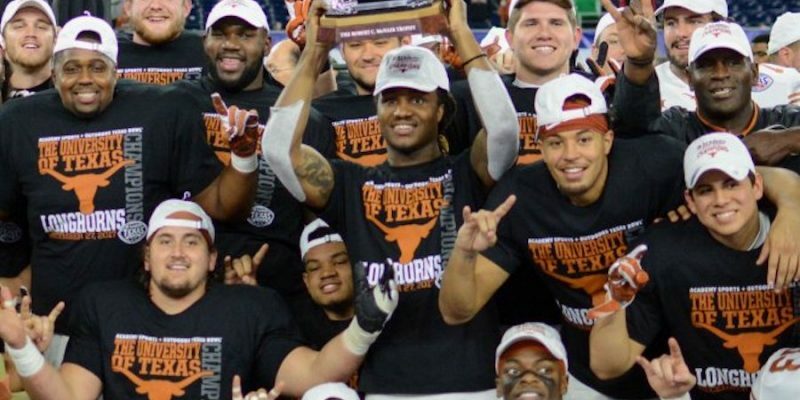 The team went into the game with a depleted roster; ten players who had started during the 2017 season could not play in the Texas Bowl either due to injury or suspension. By the third quarter, Texas was leading, 23-16. In the fourth quarter, with two minutes to go, Armanti Foreman ran 18 yards, pushing Texas to a score of double, 33-16. Their win helped boost morale in Houston. How did they do it? By focusing on having fun. Before the game even started the Longhorns’ head coach, Tom Herman, posted a video online that went viral. He announced the team’s arrival to NRG Stadium in Houston with video of them walking in to the song, “Stir Fry,” by Migros. Reports reveal that Herman’s focus for the team was to have fun– to enjoy the game– and they did. Enough to win– and beat the tremendous odds against them. According to Las Vegas Texas Bowl odds predictions, Missouri was favored by 2.5 over Texas with an over/under of 60.5. In other words, the Texas win was a major upset. The Texas Bowl (the Academy Sports + Outdoors Texas Bowl) is a post-season NCAA-sanctioned Division I FBS college football bowl game. The first game was held in 2006 in Houston, Texas.